Free Bluetooth Remote:( How to use it : Youtube Link : https://youtu.be/aOObqrimdIw) Now It Cannot Get Better Than This.In Our Constant Effort To Give Value To Our Buyers, We Are Offering Free Bluetooth Remote . Now Our Buyers Do Not Need To Buy Any External Controllers. Its A Complete Package. BETTER RESULTS: This vr headset has Adjustable On Pupil Distance And Removed The Object Distance For Better FOV . Short-Sight Suitable: 0-600°,Can Wear Glasses When You Use Virtual reality 3D Glasses.Augmented Reality Compatible : Supports Most Of The Mobiles For Augmented Reality Due To The Unique Front Panel Design. 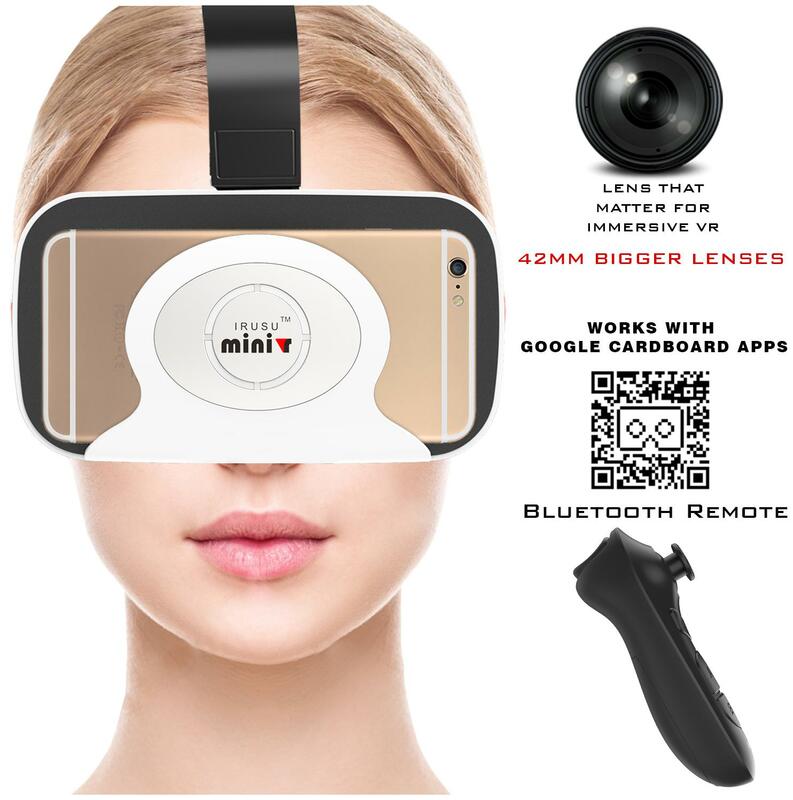 ALL VR IN ONE PLACE : Get our App " Irusu VR Zone " to have all the VR apps at one place.We have done an extensive research in providing latest and hottest apps at one place by collaborating with top virtual reality developers across globe, to give our buyers the top notch stuff.Get it now from playstore just type in "IRUSU". COMPATIBILITY : ( The remote does not work properly with latest IOS 10.2 version ) The Mobiles Should Have Gyroscope , Accelerometer For Head Tracking. Hence If Mobiles Have These Two Sensors They Can Start Using Our VR Headset.